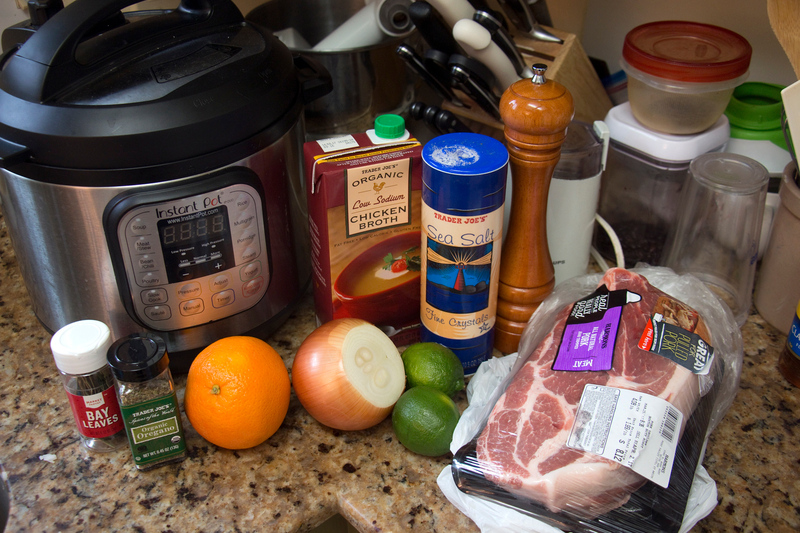 Instant Pot Pork Carnitas Mama Say What?! | Mama Say What?! We make pork carnitas in our house at least a couple of times every month. 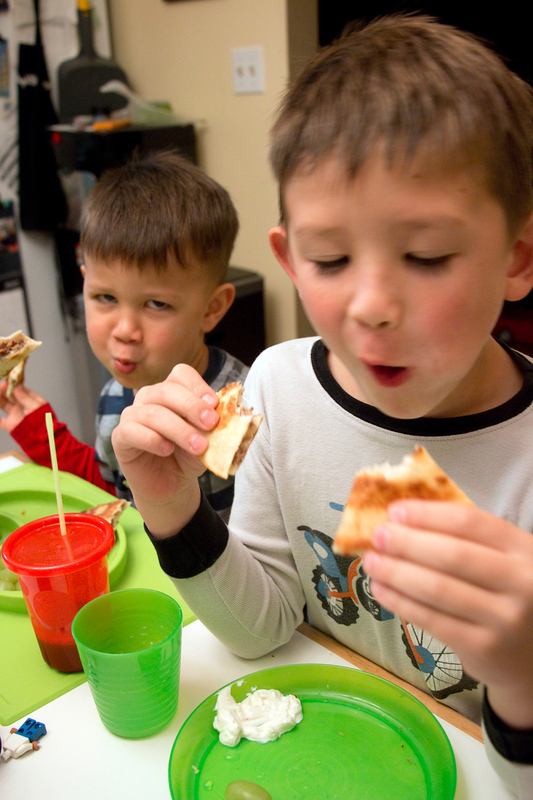 My boys love the shredded pork in quesadillas, in tacos, with eggs at breakfast, and my oldest has decided he now loves nachos. I have been following a recipe I got from Serious Eats faithfully and it’s been amazing every time. But it takes quite a long time to make and I have to remember to start it early enough in the day. I have honestly forgotten many times to start it before 3pm. 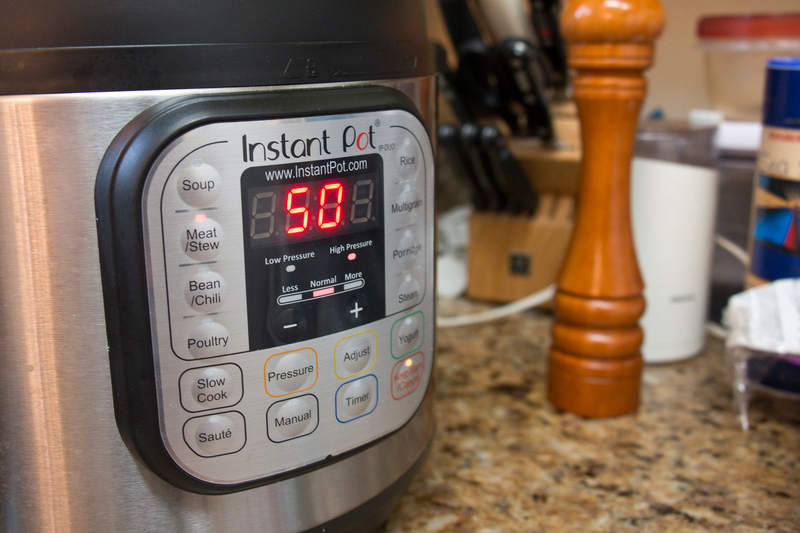 I vowed to find a way to make it with my Instant Pot in less time and I’ve been really happy with the results. 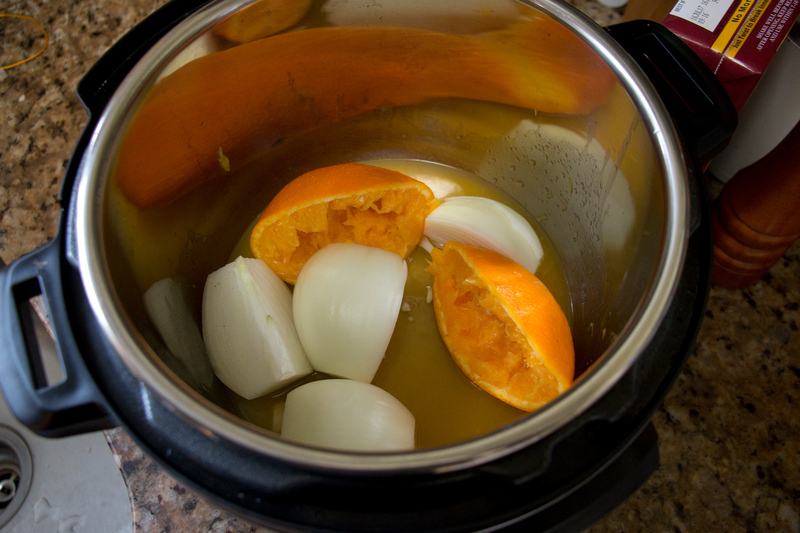 Juice the orange and the limes and pour the juice into the Instant Pot. Throw in the rinds too (peel off any stickers), along with the quartered onion. Add the chicken broth, pork, oregano, bay leaves, salt, and pepper. Toss everything together with your hands so the pork is evenly coated and the spices are somewhat evenly distributed. 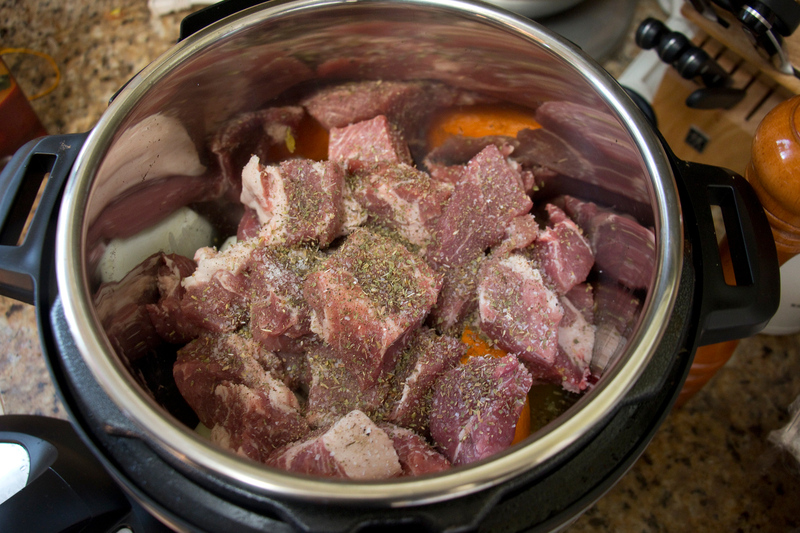 Press the meat/stew button and adjust the time to 50 minutes. When the time is up, let it release naturally for about 10-15 minutes. Then flip the valve to release the rest of the pressure. 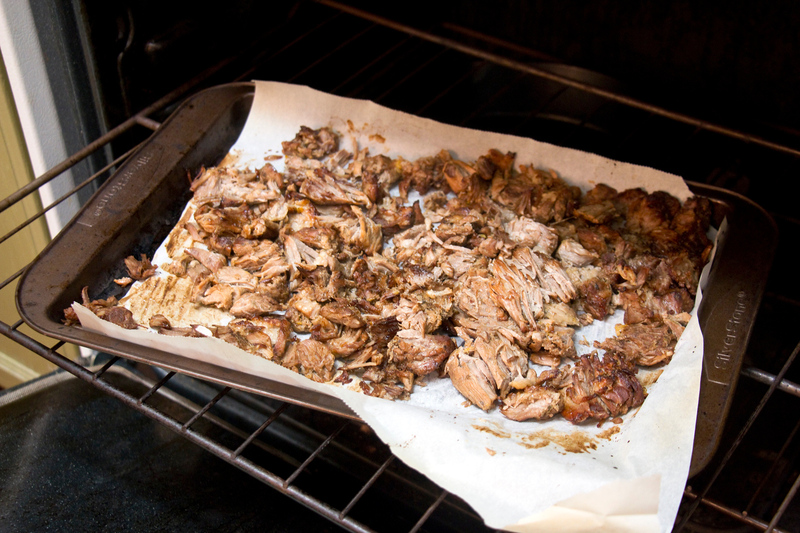 Remove the pork from the pot with tongs and transfer to a cookie sheet or sheet pan that’s been lined with parchment paper. Discard the orange peels. Shred with a pair of forks and then drizzle a couple of tablespoons of the liquid from the Instant Pot over the pork. Broil for a few minutes. Toss the meat with the tongs or flip it with a spatula so more of the meat can crisp. Broil for a few more minutes. Watch it carefully, it can burn really quickly. Serve inside tacos, quesadillas, or a burrito. Or alone with rice and some cheese. 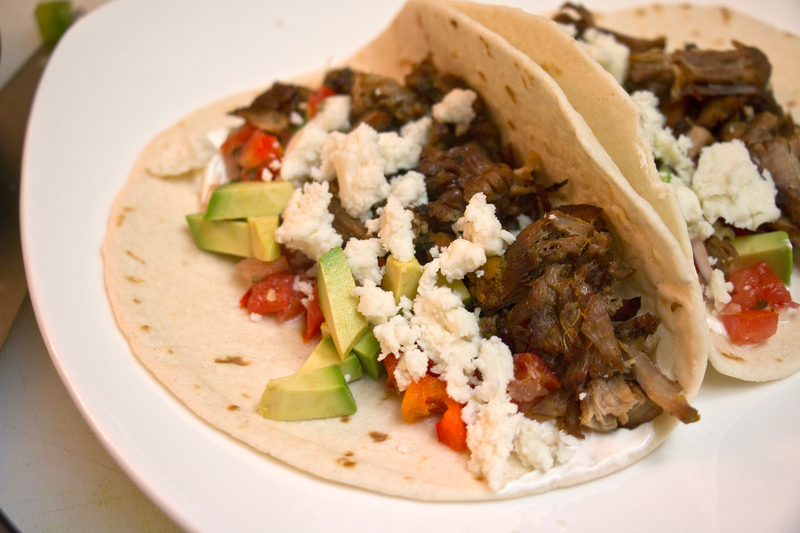 I love to eat carnitas with scrambled eggs, avocado, and queso fresco too. Juice the orange and the limes and pour the juice into the IP. Throw in the rinds too (peel off any stickers), along with the quartered onion. Add the chicken broth, pork, oregano, bay leaves, salt, and pepper. 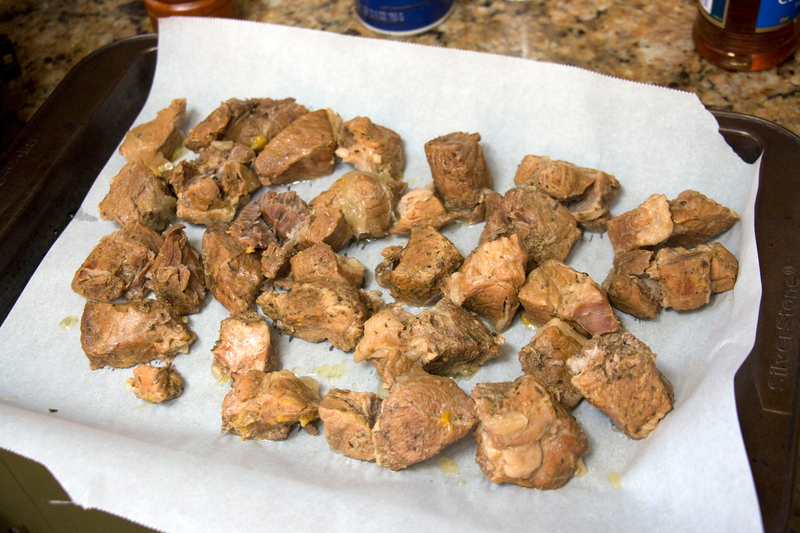 Toss everything together with your hands so the pork is evenly coated and the spices are somewhat evenly distributed. 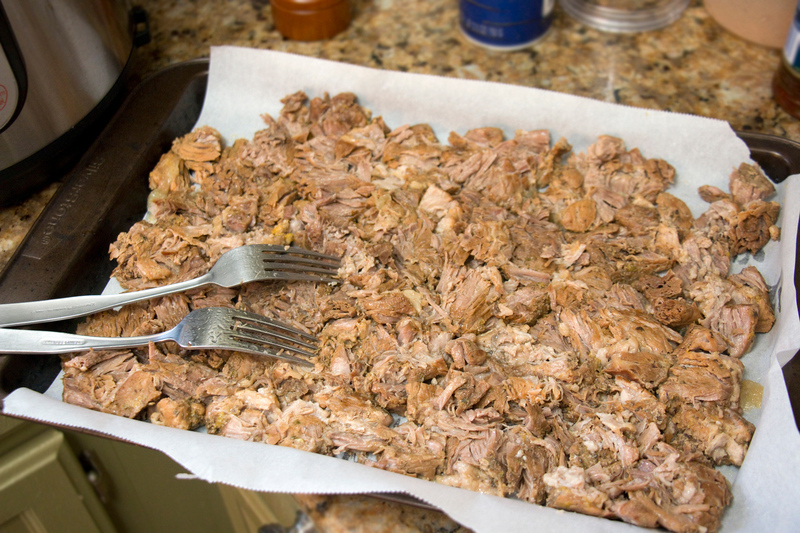 Remove the pork from the IP with tongs and transfer to a cookie sheet that’s been lined with parchment paper. Shred with a pair of forks and then drizzle a couple of tablespoons of the liquid from the Instant Pot over the pork. Serve inside tacos, quesadillas, or a burrito. I love to eat it with scrambled eggs, avocado and queso fresco. Enjoy!! Added by Alex T. on March 17, 2017. This makes me want an instant pot! I have a pressure cooker and crock pot, but I wonder what the great advantage the instant pot gives you.